God is loving, holy, just, and righteous. He is the Creator of the entire universe. He made human beings in His image and desired to have personal relationship with us. The problem is that people choose to disobey God and go their own way. This results in separation from God. The Bible says… “For all have sinned and fall short of the glory of God” (Romans 3:23, NIV). “But your iniquities have separated you from your God; your sins have hidden his face from you, so that he will not hear” (Isaiah 59:2, NIV). The Bible says, “For God so loved the world that he gave his one and only Son, that whoever believes in him shall not perish but have eternal life” (John 3:16, NIV). “This is good and pleases God our Savior, for he wants everyone to be saved and to come to understand the truth” (1 Timothy 2:3-4, NASB). God sent His Son to bridge the gap. Christ did this by paying the penalty for our sins when He died on the cross and rose from the grave. The Bible says… “But God demonstrates his own love for us in this: While we were still sinners Christ died for us” (Romans 5:8, NIV). “For there is one God and one mediator between God and men, the man Christ Jesus…” (1 Timothy 2:5, NIV). “For the wages of sin is death, but the gift of God is eternal life in Christ Jesus our Lord” (Romans 6:23 NIV). You cross the bridge into God’s family when you confess Christ as Savior and Lord. The Bible says… “Yet to all who received him, to those who believed in his name, he gave the right to become children of God” (John 1:12, NIV). “That if you confess with your mouth, ‘Jesus is Lord,’ and believe in your heart that God raised him from the dead, you will be saved” (Romans 10:9, NIV). Admit that you are a sinner in need of forgiveness. 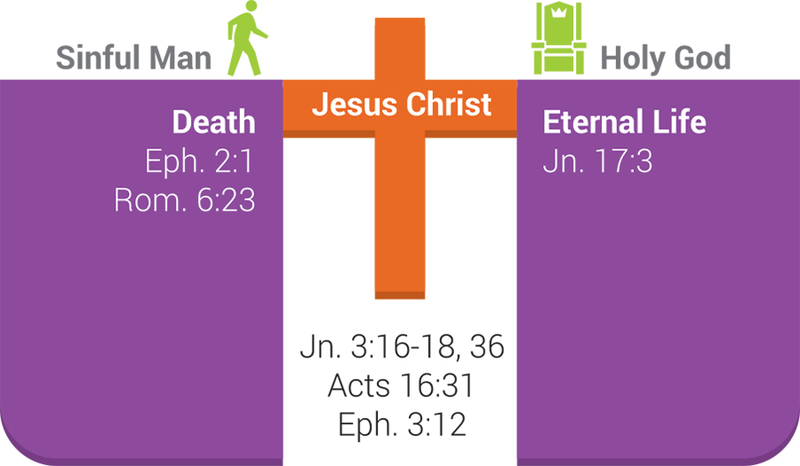 Believe that Jesus died for your sins on the cross and rose from the dead. Confess Jesus as your Savior and Lord (use the suggested confession of faith below). I admit that I am a sinner in need of forgiveness. I believe that Jesus is the Christ, the Son of the living God. I want to turn from my sins and accept Jesus as my personal Lord and Savior. Decide to follow Jesus for the rest of your life. An example of this would be to get baptized right away (see Mark 1:9, Matthew 28:19-20, Acts 18:8, and Romans 6:3-4). Read your Bible daily (Colossians 3:16; Psalm 119:11). Pray daily (Philippians 4:6, 7; 1 Peter 5:7). Attend church weekly (Hebrews 10:24-25; Acts 20:7). Join a Life! Group, a home Bible study fellowship (Acts 2:46, 47). Find an area in which to serve (1 Peter 4:10, 11; Romans 12:4-8). Rely daily on the power of the Holy Spirit. (Galatians 5:16-25). As you begin to grow closer to God, you will begin to see the fruit of the Spirit being developed in your life (Galatians 5:22-23). Always remember that God loves you and has a plan for you—and that His plan is better than anything you could ever achieve for yourself, ask for, or imagine!